Senate Bill 326 (Hill) would require community associations to inspect balconies and other elevated structures to assure they are safe, by establishing practical procedures which associations can follow when they perform reserve studies. The bill also eliminates barriers imposed by builders to the rights of associations to recover for improper design and construction. In 2018, CAI-CLAC helped to defeat provisions which would have required community associations to perform invasive testing on balconies and other elevated structures every six years. 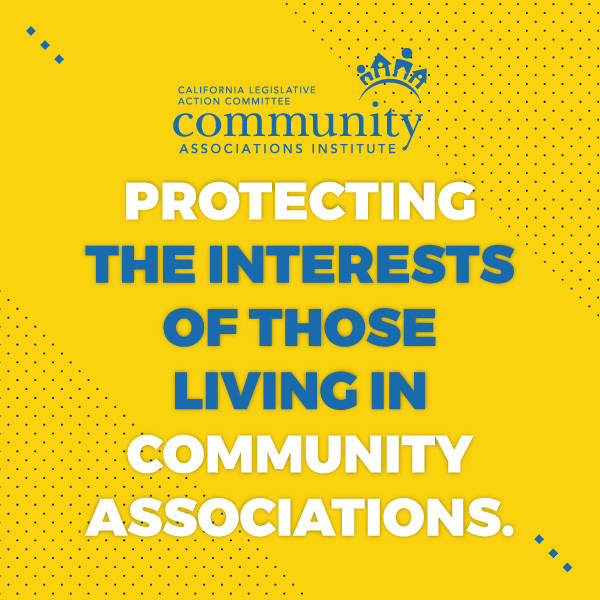 This year, CAI-CLAC had the opportunity to assist Sen. Hill in crafting a process which makes sense for community associations while at the same time meeting the public policy goal of protecting residents’ safety. Every nine years, condominium associations would be required to conduct a visual inspection (by an architect or structural engineer) of a statistically significant sample of elevated structures such as balconies, decks, stairways and railings. If evidence of water intrusion is found, the inspector would use their best professional judgment in deciding on any further needed investigation. The inspector would write a report including the current condition of the elevated structures, their expected future life and anticipated performance, and any repair recommendations. The first inspection must be completed by January 1, 2025. S.B. 326 would also provide that an association’s board may decide whether to pursue claims against a builder or developer; developer-affiliated board members can’t participate in the decision; and other approval requirements in governing documents are not enforceable. CAI-CLAC supports S.B. 326 and its practical solutions. Senate Bill 754 (Moorlach) would allow candidates for community association boards to be elected by acclamation, without counting the ballots, if the number of candidates does not exceed the number of open seats when nominations are closed. Associations must provide notice of the election and the procedure for nominating candidates at least 30 days before the close of nominations. The bill also assures that this procedure can be used in associations with 5,000 or more members, by making a change to the election provisions in the Corporations Code. It doesn’t make sense to count ballots where the result of the election is not in doubt. CAI-CLAC supports S.B. 754. You can view these and more bill updates on our Legislative Session Hot Bills page. If you have any questions, you can contact us at office@caiclac.com.